The glamorous beach side town of Barcelona versus the cultural capital of Madrid. Excellent architecture, culture and cuisine – not to mention weather – have made visiting these Spanish cities high on many people’s bucket lists but which one would win when it comes to a head to head? 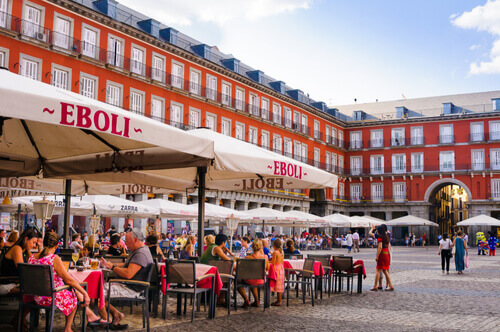 The Baroque royal palaces, the neoclassical museums, strolling through the tree-lined boulevards or the quaint narrow backstreets of Madrid is a marvel for the eyes. Barcelona however, is an architectures dream. Baroque, Gothic, and early 20th century modernist architecture all seamlessly merge together to create a unique architectural experience hard to beat. 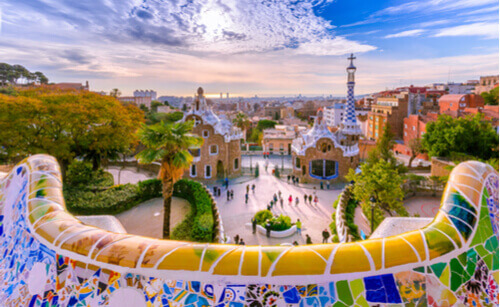 Antoni Gaudi was responsible for many of Barcelona’s most famous landmarks including the Gothic inspired Sagrada Familia, Casa Mila and Park Güell and still is synonymous with the city. As home to one of the world’s most eccentric and well-loved architect, the prize has to go to Barcelona. 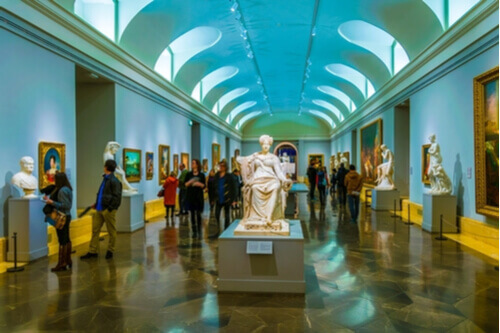 Madrid is jam packed with art museums where the old masters such as Goya and Titian are hung alongside more modern art icons such as Picasso and Dali. But pop into one of the cities excellent galleries such as Travesía Cuatro to discover some emerging talent, or Juana de Aizpuru for some contemporary photography. The Picasso Museum, the Joan Miro Foundation and Gaudi’s Casa Mila Museum in Barcelona combined with the Barcelona Museum of Contemporary Art will certainly keep an art lover busy for a few days, too. The sheer volume, quality and bold experimentation of Madrid just nudge it to the top spot. With an astounding 8.69 million visitors a year, Barcelona is one of Europe’s most popular tourist destinations, and with that, sadly come high prices. Expect to pay more for everything from rooms, meals and taxis compared to its inland neighbour. Madrid on the other hand offers great value for money. Stroll down Cava Baja – or Tapas street as it is known – for €2 (AU$3) glasses of wine and €1 (AU$2) tapas bites. Boutique hotels abound in Madrid and many museums are open for free on certain nights of the week. Hands down, Madrid offers better value for money every time. Barcelona has some fantastic fine dining restaurants. Get a seat at the bar at Canete and graze on fresh octopus, fried fish tapas whilst enjoying a fine Rioja. Or pop down to Restaurant 7 Portes for some fantastic paella. Barcelona does fine dining well, but expect to pay for the experience. Madrid’s food scene is far more local and certainly more authentic. 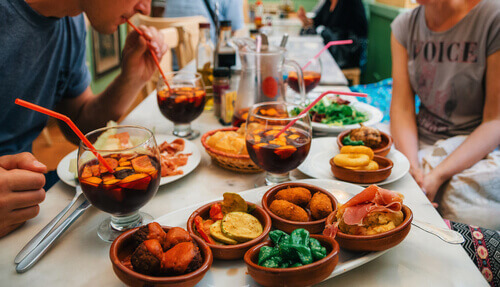 You can graze on tapas at one of the many markets, pop into one of literally thousands of street side tapas restaurants, or for something a little more fancy, get a table at one of the romantic establishments that serve a variety of home-style or classical dishes. One of our favourites is Café Comercial, where you should make sure to share the whole monkfish. When it comes to two such foodie cities it’s hard to pick a winner but Madrid’s cuisine is a touch more authentic and it’s easier to avoid the tourist traps and meal deal offers. Beaches, Beaches, Beaches. Barcelona has its own fantastic beach right in the centre of the city. Not only that, but along the coast and accessible by train are a whole host of other beaches such as the beautiful El Garraf. The nearby town of Sitges has over a dozen great beaches and all have some fantastic local restaurants serving often better quality food at a fraction of the price of that of Barcelona. Madrid has some excellent day trips for those looking to venture outside of the city. Consuegra has been famous for its windmills since the 16th century. Cervantes fans will not that this is where the knight from Don Quixote battles with the windmill sales he mistook for giants. You can’t beat a downtown beach. 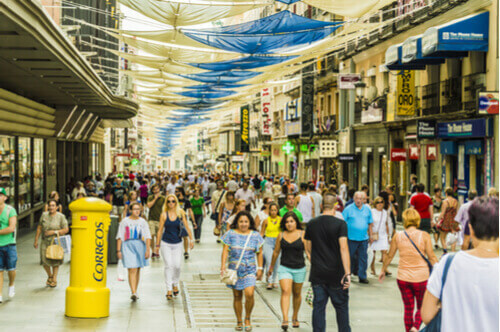 Barcelona’s Las Ramblas is one of Europe’s most famous shopping streets where at one end street hawkers mix with small stall holders to sell tourists hats and tat and gradually it goes more and more upmarket ending amongst luxury retail outlets and fashion stores. Much of Madrid’s charm are its distinct neighbourhoods, often situated around a market square. Whether its vintage clothing, boutique stores, antique hunting or simply stocking up on essentials there really is something for everyone. The touts that flood the streets of Barcelona are no competition for the unique markets of Madrid. Although not large, Madrid is divided up into different areas – often around a square and wandering at night through different areas is like bouncing between eras, places and cultures. Poetry reading hipsters can be found in hidden drinking dens in Lavapiés. Trendy bars and nightclubs dominate the Centro district and the alternative scene is blossoming in Malasaña. There’s something for everyone whether it’s flamenco, jazz, dance or just people watching on a square. Calling Barcelona’s nightlife scene vibrant is an understatement. Like most places in Spain, it doesn’t normally get going before midnight and rarely dies down before dawn. Bars off Las Ramblas are often packed with stag and hen parties and can get rowdy, whereas El Born and the Gothic quarter the areas to find stylish cocktail bars like Milk, while hipsters hang out in the Raval district. Barcelona also has some of the country’s best music festivals including Primavera Sound and Sonar Festival. It’s a really tough one but Madrid just pips Barcelona due to its lack of stag parties and more varied and authentic options.